Am I too old to say I “heart” something? Oh well, I just did! On Monday, also known as the last day I felt even remotely warm, I ventured out to find some goodies to get me through this week’s arctic cold blast. I found this cool rusty red tin at the antique mall. I’m a sucker for rusty tins. They’re great to hide stuff in on a bookshelf or counter and it was only 3 buckaroos. And it’s red. Anything red is good for the big V day coming up. Speaking of Valentine’s Day, I’m also a sucker for old Valentines. LOVE them! So when I found these 1950’s Valentines, I snatched them up for $1 a piece. An adorable puppy sitting in his little doggie bed. And a cute girl sitting in a rocking chair with her brand new kitten. How do I know they’re from the 50’s? Grandma and Grandpa signed and dated them. Can we get a collective Aww? 1 .. 2 .. 3 .. Aww!!! And I found a hobnail Fire King planter/jardiniere/whatever-the-heck-it’s-called thingie at the thrift. I’m not a huge hobnail fan, but it sort of matches the pink one that I own. 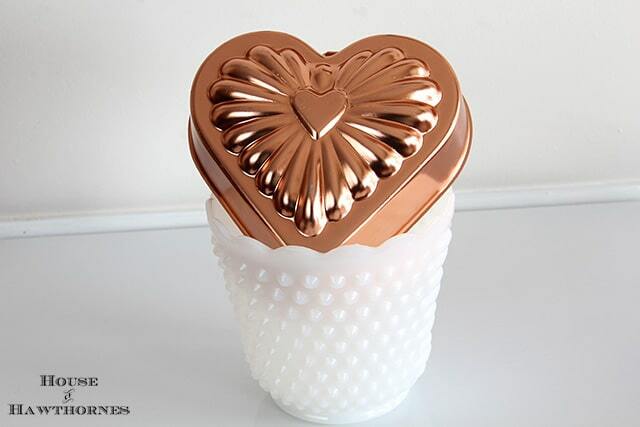 I also bought this copper colored heart mold for 99 cents. You’ll see it in another post this week where I make something with it. Yes, I actually use this stuff sometimes! I can assure you I did not make jello with it though. Well, maybe I did in a round about way, but you’ll have to wait to see it. Hey, is this what he meant, when Jim Croce sang about saving Time In A Bottle? It’s really a jar, but same difference. I found the Westclox Baby Ben alarm clock at a thrift store before Christmas for 99 cents and I forgot to show it to you. It does work, but I do not wind it!!! Have you ever noticed how LOUD ticking clocks are? How people ever lived with that constant TICK, TICK, TICK before the invention of electric clocks is beyond me. OK, I’ve got a HUGE case of spring fever today. It’s 10 degrees as I write this and my son is actually back at school. After all these snow days, negative degree temps and being cooped up in the house, I’m getting pretty darn excited about this little heat wave of ours and I’m going to celebrate it by heading off to some more thrift stores. Wish me luck. BTW, thanks so much for all the comments and emails on my last post. You guys are the bomb! I have a major weakness for old tins too. Maddie had to talk me out of buying one at the flea market on Sunday that I already had. I knew I already had it but it was only 5 bucks! Do I have a problem? Can’t wait to see what you do with that heart mold…. Great finds! What a steal on that clock. I can’t stand the tick, tick, tick either! I know! I couldn’t leave it there for THAT price! Great finds Pam! 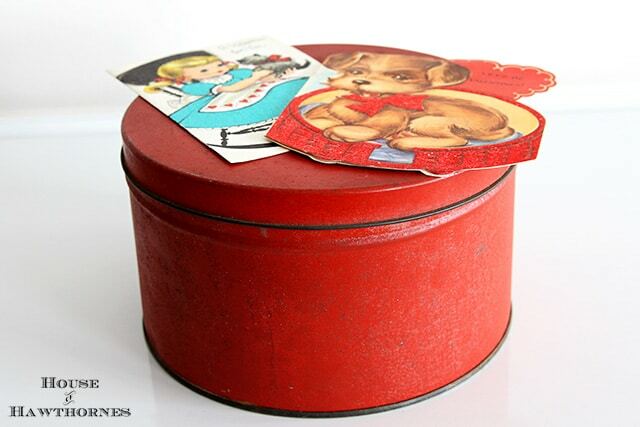 I’m drooling over the red tin and I adore the sweet valentine cards. I have got to get myself to the antique store asap. I haven’t added any vintage cards to my collection this year which is bad, bad, bad! Yesterday was actually above freezing here and it was amazing! Today, six inches of snow is falling but it’s not to cold. I’ll take the snow over arctic cold any day. I love old clocks too and even have a big jar like yours! (mine has cookie cutters in it). And it’s fun to find Valentines. I have printed a few off from the internet. Enjoy your day! 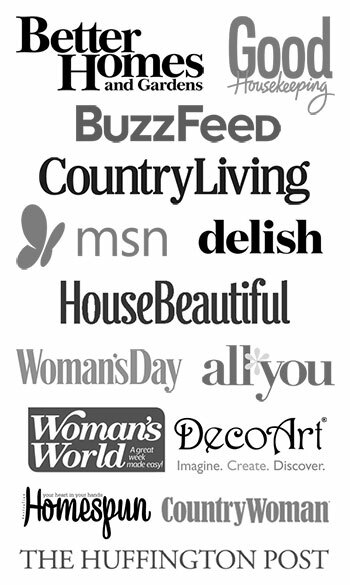 I heart your blog! Hugs! 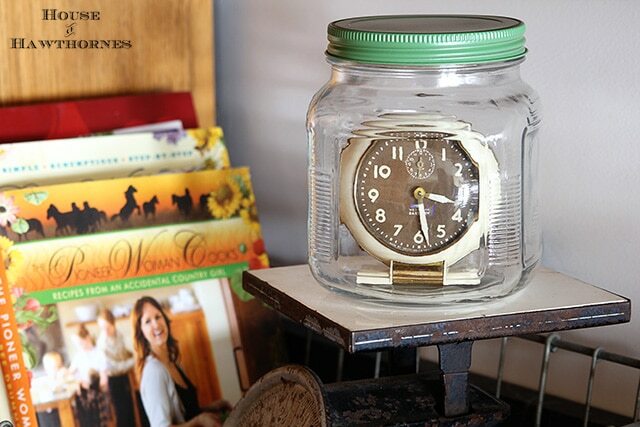 Oh that clock in a jar is just the greatest thing….I really love that! This weather is very trying. Winter is not my favorite time of the year and this one is too darn cold. I cannot sleep with a ticking clock because my brain begins to make up little ditties which is not the best way to fall asleep. I suppose some clocks can sound soothing depending on the sound, but not while I am trying to fall asleep. My mother in law was from the generation that adored jello salads. Wonder if the molds will make a come back-you will be in the catbird seat. And I found some more molds today, so I am all set for the day when Martha Stewart says that jello salad is cool again! I’m in love with the clock in a jar (can you hear it ticking in there?) 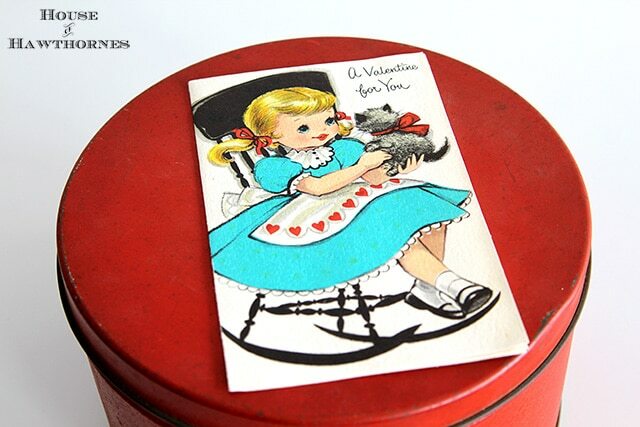 and the tin and cute valentines are wonderful…wish I could go thrifting with you! You really found some great finds. I like old tins also. So sorry that your weather is so bad, hopefully you will be getting some warmer weather. Stay warm and have a great weekend. Fun finds as always. I love the clock, but I agree on the TICK, TICK, TICKING. Clocks that TICK are not permitted in my house. When we first got married, my husband’s Mother gave him a clock that went TICK, TICK, TICK and then on every hour a different bird chirp emitted from it. Do you have any idea how unsettling it is to hear a WOODPECKER over your head at 3:00 am? I “hid” that sucker PRONTO. Stay warm! We have 45 mile an hour winds today. What a crazy Winter this has been! By the time I go looking for a jar you will have all of them. Well, finders keepers, as they say. That one is one of the little Walmart ones. I think they call them cracker jars. I’m pretty smitten with your Valentines too. I hit an estate sale before work this morning. It was literally on the way and only took 15 minutes but it gave me some much needed “joy”. It’s been slim pickings in estate sale land since our state turned into Alaska. I understand the winds and snow will be starting back up by 4pm today. The girls are finally back in school. They were actually BORED. What great finds. Those 50’s Valentines are just adorable as can be. Thanks, Ida! I’m going to try to find a few more older Valentine’s this week and then scan them and put them on the blog. Then people can print them out if they want to use them for crafts and such. I could never stand a ticking clock – I remember sleeping over at my grandmother’s, her clock was so loud, I made her put in the hall closet!!! Love the Valentines, so sweet! 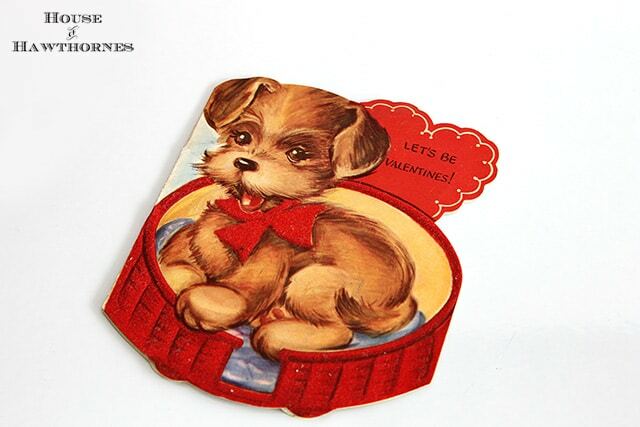 Love the old tin and the valentines. The clock in the bottle is awesome. Clever, indeed. Those are cute! I love vintage decorations so much! They have so much character. Pam.. one is never to old to say they “heart” something **smile**. Love your thrift finds! Lucky girl. Guess in days gone by, everyone was too tucked out from hard work to even hear those ticky-tocky clocks ….. not too many modern conveniences. 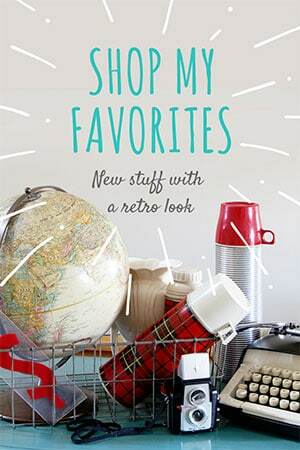 Hope you have a warm up there, and have a great thrifting weekend!! You found such good stuff. I especially love the old valentines and the heart mold! I would have to paint that one red! My hubby and I just did a little thrifting together the other day. Much needed fun and therapy. I only came home with a few scores, but I love them. You got some cute stuff Pam! I love the cards and the clock in the jar is too cute. A vintage clock for 99 cents?! Lucky you! Wow that’s awesome – what a deal!! I have 3. One was free it was my Mum’s the other 2 were about 5 bucks each and I thought that was a deal!! BTW – saw the PW cook book – LOVE her recipes and have all 3 of her cook books! What a great post and lovely ideas. I am visiting you via Wow Us Wednesdays and look forward to seeing you at My Dream Canvas.